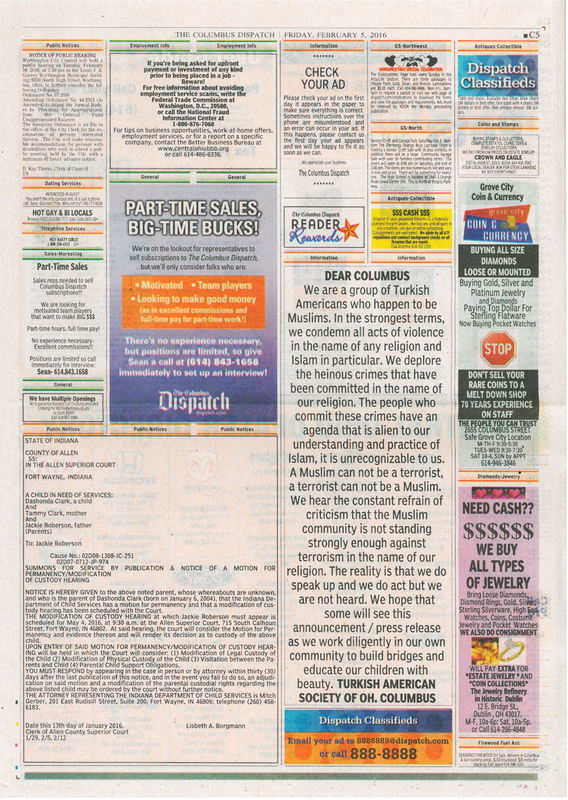 Please see our Dispatch ad that is on print 2/5-2/6-2/7 2016. We hope to voice our stand against violence and let that be known by the wider community. Please help spread the ad through your social media platforms. We are a group of Turkish Americans who happen to be Muslims. In the strongest terms, we condemn all acts of violence in the name of any religion and Islam in particular. 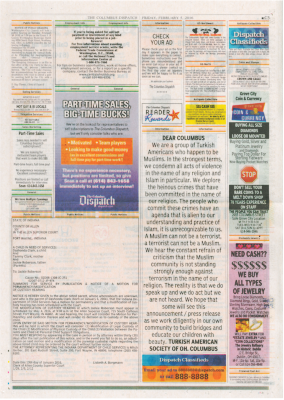 We deplore the heinous crimes that have been committed in the name of our religion. The people who commit these crimes have an agenda that is alien to our understanding and practice of Islam, it is unrecognizable to us. A Muslim can not be a terrorist, a terrorist can not be a Muslim. We hear the constant refrain of criticism that the Muslim community is not standing strongly enough against terrorism in the name of our religion. The reality is that we do speak up and we do act but we are not heard. We hope that some will see this announcement / press release as we work diligently in our own community to build bridges and educate our children with beauty. Welcome to the Holy Month | Ramazan’a Hoş Geldiniz!